Peter Paul Rubens (1577–1640), Deucalion and Pyrrha (1636), oil on panel, 26.5 × 41.5 cm, Museo Nacional del Prado, Madrid. Wikimedia Commons. In Ovid’s account of the creation, Jupiter, the king of the gods, wants to destroy mankind because of its unacceptable behaviour, and to create a new, better type of human. At first he intends doing this by fire, but decides that a flood is the preferred solution. 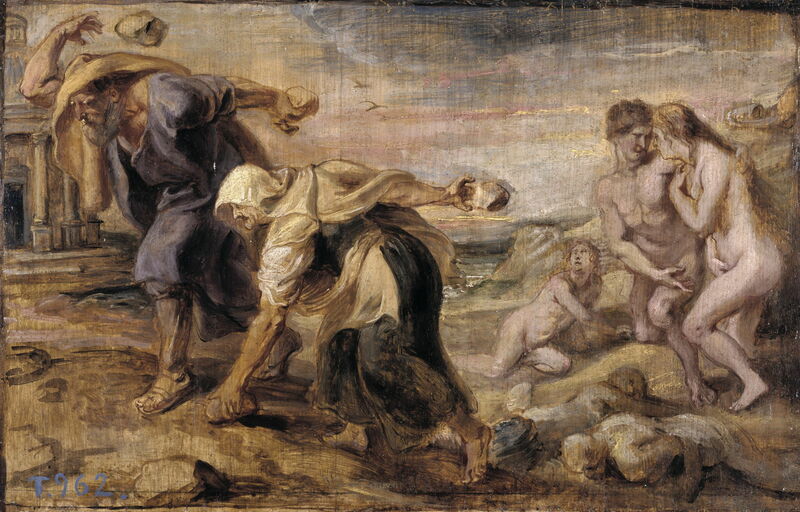 Following a vivid description of the production and catastrophic effects of Jupiter’s flood, Ovid reveals its two survivors: a man named Deucalion and his wife (and cousin) Pyrrha. Their small and fragile boat is washed up on the summit of Mount Parnassus, whose twin peaks are the only remaining land. Deucalion is a son of Prometheus, the Titan who stole fire from Mount Olympus to give to mankind, and was punished by Jupiter as a result. The couple worship the gods there, demonstrating their piety and simple virtue. Jupiter responds by reversing the flood, so that the waters recede, and land reappears covered with mud and ooze. Deucalion realises that they are the only living beings alive, and the couple weep. They then go to the temple of Themis, a Titan and ancient goddess concerned with fairness and justice, and ask her to help re-establish mankind on earth. the bones of your great mother. as marble statue chiseled in the rough. and prove by toil and deeds from what we sprung. This is the second myth of metamorphosis to be related by Ovid. There are many paintings showing the Biblical flood from Genesis, but few of the classical myth above. 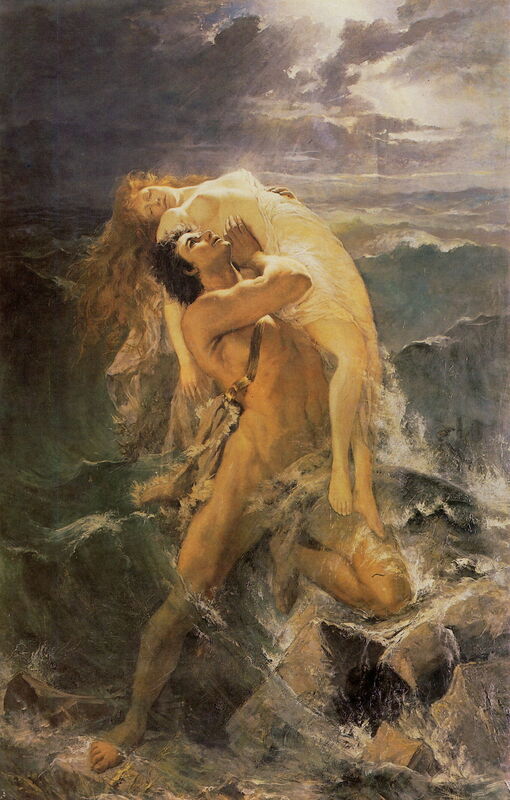 Paul Merwart’s marvellous The Flood is conveniently sub-titled Deucalion holding aloft his wife to make it clear that this depicts the classical myth, although the couple’s boat is nowhere to be seen, and there seems no obvious reason for them being unable to procreate themselves in order to produce the next generation of humans. Leonaert Bramer (1596–1674), Scene from the Metamorphoses (Deucalion and Pyrrha) (c 1665), watercolor and gouache on vellum, 14 x 19.5 cm, Private collection. Wikimedia Commons. 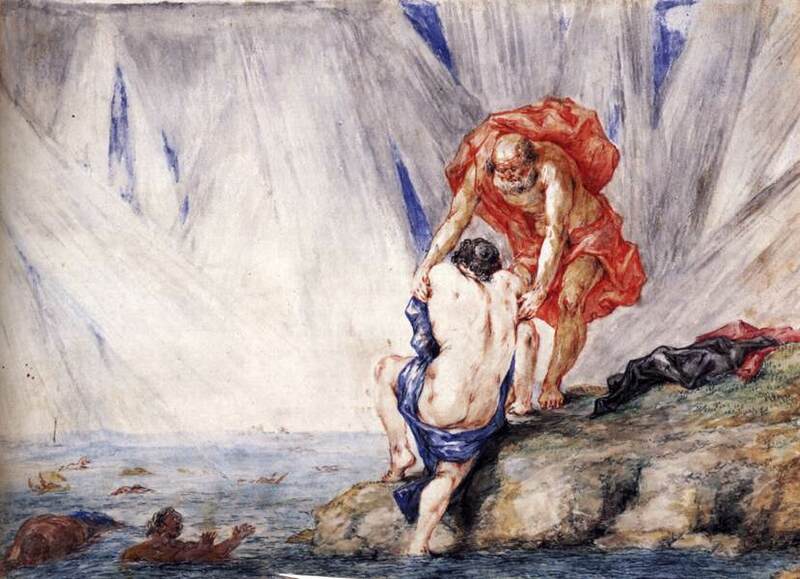 Leonaert Bramer’s watercolour miniature of Scene from the Metamorphoses (c 1665) appears to show an elderly Deucalion assisting Pyrrha from the waters. Presumably the other bodies shown in the floodwaters are already dead or dying. Slightly more popular with artists is the scene of transformation, in which the couple throw stones over their shoulder, and the rocks then change into humans. Several of these are confused, but my favourites are by Bottalla and a very late oil sketch by Rubens. Giovanni Maria Bottalla (1613–1644), Deucalion and Pyrrha (c 1635), oil on canvas, 181 × 206 cm, Museu Nacional de Belas Artes (MNBA), Rio de Janeiro, Brazil. Wikimedia Commons. 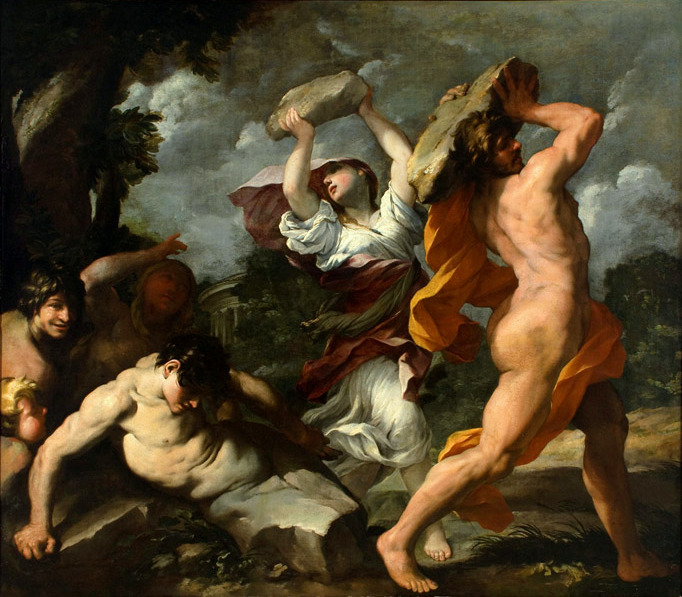 Giovanni Maria Bottalla’s Deucalion and Pyrrha (c 1635) is a well-composed narrative painting which clearly details Ovid’s version of the myth. Pyrrha and Deucalion, who has overdone Themis’ injunction to ungird his robes, stride forward, dropping hefty rocks over their shoulder. At the left, humans are seen to be emerging from those rocks by a process of metamorphosis, much as a sculptor might form their figures from marble blocks. Peter Paul Rubens’ Deucalion and Pyrrha (1636) shows an aged Deucalion and Pyrrha, clearly beyond any hope of parenthood, which at least explains why this metamorphosis was needed. As their more reasonably-sized rocks transform, they follow an ontogenetic process, instead of behaving like sculpted blocks. Rubens also treats us to some interesting details: the couple’s boat is shown at the top right, and a newly-transformed couple appear already to be engaged in the initial stages of making the next generation without the aid of metamorphoses. The actions of Deucalion and Pyrrha provided the human population, but Ovid tells us that all other life was restored by spontaneous production from the fermenting mud left by the flood, under the rays of the sun, providing the combination of the ancient elements of heat and moisture in combination. One of the creatures so created was the huge and monstrous serpent Python, which brought fear to mankind. As a conclusion to the story of the flood, Ovid writes that the god Apollo “destroyed the monster with a myriad darts” from his bow. To celebrate the death of Python, Apollo instituted the Pythian games, but because the laurel had not yet been created, its victors were awarded crowns of oak leaves, not laurels. 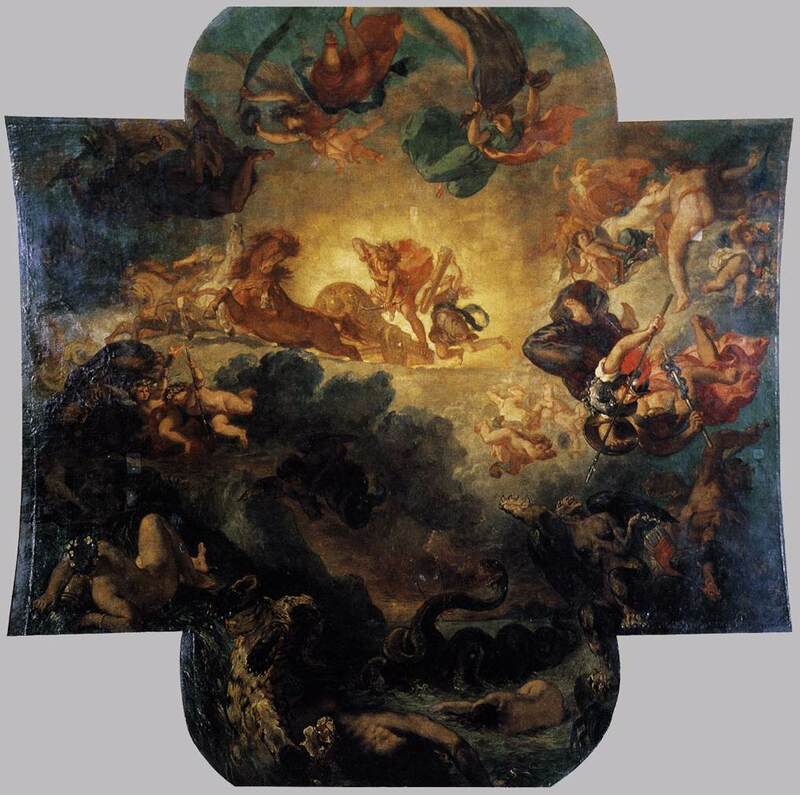 Eugène Delacroix (1798–1863), Apollo Vanquishing the Python (1850-1851), mural, 800 x 750 cm, Musée du Louvre, Paris. Wikimedia Commons. On of the most spectacular paintings of any Ovidian story is Eugène Delacroix’s huge mural of Apollo Vanquishing the Python (1850-51) in the Louvre. Apollo is seen in the centre, in his sun chariot, with another arrow poised in his bow and ready to strike Python, at the bottom of the image. 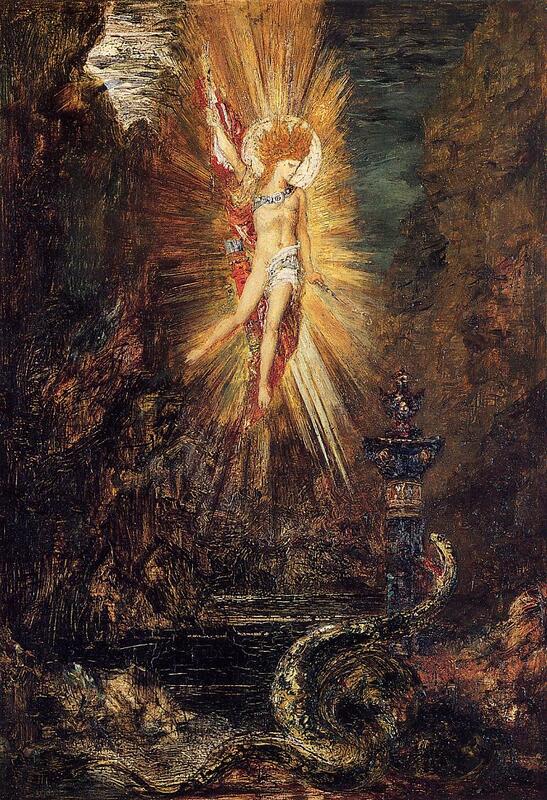 No doubt influenced by that, Gustave Moreau’s Apollo Vanquishing the Serpent Python (1885) is more modest in scale and ambition. Curiously, Apollo is shown holding his bow in his right hand so that it barely looks like a bow at all, but Moreau seems to have used a visual pun and also made it bear a flag, reminiscent of the figure of Marianne in Delacroix’s Liberty Leading the People (1830). Posted in General, Language, Life, Painting and tagged Deucalion, flood, Metamorphoses, myth, narrative, Ovid, painting, Python. Bookmark the permalink.